Double up your card layout and say more to your customers. Our two sided business cards offer an opportunity to display twice the amount of company information without compromising the aesthetics of your card design. Use the second side of your business card to talk about the services and products you offer, or be more adventurous with high impact imagery or memorable slogans to get your company noticed. 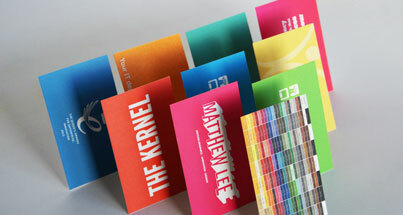 Matt 340gsm, Laminated 360gsm, Recycled 350gsm and more. Items are typically printed and delivered in 5 to 7 working days. More info. Our designers are on hand to create your artwork. Double sided prices exclude VAT at 20.0% (where applicable). Prices are in British Pounds (GBP). Click here for International Delivery. The obvious benefits of double sided business cards. When deciding on how many sides your cards should have, we always recommend picking a double sided business card because you get twice as much brand exposure. 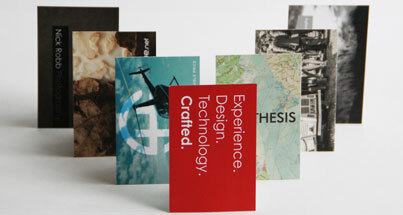 A business card with two sides gives you more space for company information and general content. In pursuit of promoting your products and services, it is all too easy to fall into the trap of trying to cram too much information on one side of your card, which will inevitably spoil the design. The difference in price between single and double sided business cards should not be a barrier to ordering, as the resulting finished card and the effectiveness of the layout will be much more professional and enhance your company brand. Two sided business cards are better than one. Our versatile templates allow you to personalise both sides of your business card design. Get creative; add more content, imagery or your company logo to the reverse for a fantastic result. If you already have a design for your dual sided idea, we can print from your artwork file instead. Our designers offer free design support with any printed order and we accept all file types for your two sided layout.